Victoria – Today, the Forest Practices Board released its report concluding its investigation of a complaint about a slump of soil material which flowed into an unnamed stream. 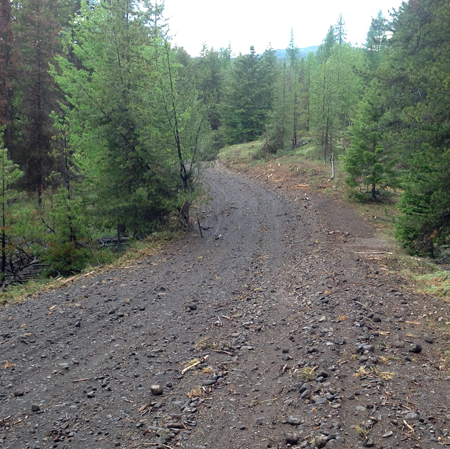 The slump occurred on a newly constructed logging road approximately 45 kilometres northeast of Terrace BC. The road, known as Fiddler Main Road, was built by Skeena Cellulose Inc. (SCI). The Board found that the SCI did cease work and promptly began cleanup to prevent further damage when staff discovered the slump. The Board found that the Ministry’s investigation after the slump occurred did not consider relevant issues that had been raised by members of the public. The district manager’s conclusion that there was no contravention of the Code, and therefore no penalty, was flawed. While some of the slump reached a stream that provides habitat for the tailed frog, the Board found that the Code did not require protection of tailed frog habitat at the time of the slump. The tailed frog is now on the list of identified wildlife that must be protected in the Identified Wildlife Management Strategy recently introduced by government. The Board made a number of recommendations as a result of the investigation. These include the recommendations that licensees use the most current terrain mapping information and that the forest district review its internal information sharing protocol and its procedures for providing information to licensees. The Board also recommended that district managers should consider submissions from the public that are relevant to the circumstances when investigating possible contraventions of the Forest Practices Code. Created in 1995, the Forest Practices Board is BC’s independent watchdog for sound forest practices. The Board provides British Columbians with objective and independent assessments of the state of forest planning and practices in the province, compliance with the Code, and the achievement of its intent. The Board’s main roles are: auditing forest practices, undertaking investigations in response to public complaints, undertaking special investigations of any Code related forestry issues, participating in administrative reviews and appeals and providing reports on Board activities, findings and recommendations.